The pending demise of the Intermediate-Range Nuclear Forces (INF) Treaty indicates the larger deterioration of the U.S.-Russian arms control relationship. The chances that the parties will resolve their disagreements are extremely low or, more realistically, nonexistent. The United States and Russia have each announced they will suspend adherence to the treaty, and Washington has formally announced its plans to withdraw from the pact in early August. The next likely victim is the 2010 New Strategic Arms Reduction Treaty (New START). All signs suggest Washington and Moscow will not be able to engage in constructive dialogue on arms control for a long time, perhaps years. Others must fill that void to prevent an unregulated arms race, and key European nations are best positioned for that role. There is little doubt that the gap between the U.S. and Russian positions can be bridged as long as the two nations view their differences as technical issues, but the problems are virtually insurmountable at the political level. The United States will continue to insist that Russia admit to violating the INF Treaty by deploying a missile that can fly farther than the treaty allows, but Russia will never concede such a violation, even if it were to agree to remove the offending 9M729 missile. Similarly, Russia could drop its concern that the U.S. MK-41 missile defense launcher could be used to fire treaty-prohibited missiles, but the United States has so far refused to treat that issue as a valid concern or allow Russia to inspect the launcher. In other words, broader foreign policy and domestic political impulses are prevailing over substantive arms control or security considerations. Some technical discussion was initiated, but too late. At a January 15, 2019, meeting in Geneva, Russia reportedly offered a demonstration of the 9M729 missile while the United States outlined procedures for the verifiable elimination of that missile. Predictably, the United States said the Russian demonstration would not be enough to prove the missile’s range, and Russia rejected both U.S.-proposed procedures for such a demonstration and the procedures for the verified elimination of the missiles as excessively intrusive. Such disagreements are natural at an early stage of negotiations, but the remaining time is short, and political conditions are not conducive for mutual concessions. Worse still, the situation concerning the extension of New START, which expires in early 2021, is almost identical. Russia has declared it would agree to such an extension only if its concerns about the U.S. implementation of the treaty are addressed. Moscow says it is not able to confirm the irreversibility of the conversion of missile tubes on U.S. strategic submarines. The United States has denied any wrongdoing and rejected any additional verification measures. This conflict has remained overshadowed by the INF Treaty crisis so far, but after that treaty’s demise, New START will move to the forefront. Given these developments, it will be vital to begin consultations on possible new arms control measures without delay because an unregulated, nontransparent, and unpredictable military balance is simply too dangerous. The collapse of arms control regimes is driven primarily by political factors, so the prospects of new consultations will depend primarily on how the INF Treaty will end, namely, whether relevant actors demonstrate, even if only indirectly, that they are prepared to start looking beyond the INF Treaty. After all, in diplomacy, signals and appearance matter as much as substance, sometimes even more. The prospects for a renewed arms control effort will be defined by answers to two related questions: Who will agree to talk to Russia, and with whom will Russia agree to talk? Who Will Negotiate With Russia? The likelihood of serious U.S.-Russian bilateral engagement seems minimal. Interaction in the remaining months of the INF Treaty’s existence will continue to be rancorous, an atmosphere that will likely persist as the deadline for an extension of New START approaches. The political atmosphere in the United States is not conducive to a serious dialogue with Moscow, and the issue of INF Treaty compliance, which will remain unresolved, is bound to generate strong opposition to a new exercise in arms control because Russia will be seen as untrustworthy by definition. Resumption of a serious bilateral dialogue will likely take years. One alternative would be for Europe to take a larger role in engaging Russia on arms control issues. Although a more proactive European role is feasible and desirable, certain challenges must be understood and addressed to ensure success. The first is the potential risk of undermining Atlantic solidarity and having such a new role be seen as a victory for Russian President Vladimir Putin. Although the concern is certainly valid, Atlantic solidarity is not synonymous with providing unquestioning support of the United States or of taking the most unyielding position possible on Russia. Solidarity presupposes consensus on policy decisions, but at the stage of policy development, debates are feasible and welcome. Second, the probability of Europe becoming a single actor appears low (members of both NATO and the European Union differ considerably on handling Russia), so the burden of new arms control initiatives will have to be borne by individual countries. This will become particularly vital if the United States decides to deploy new intermediate-range weapons in Europe under bilateral agreements rather than joint NATO arrangements. Third, European countries will likely find it difficult to include China in a future dialogue. Engaging Chinese experts is possible, but the prospects are not particularly encouraging. Nonetheless, the value of restarting serious arms control dialogue will overshadow that shortcoming. If that endeavor succeeds, China could be integrated at a later date. Given the challenges of Europe-wide representation, Germany and other European nations could play this vital role in several ways in the coming months and years. First, they can provide a platform for a wide-ranging discussion about a new framework for arms control. The German initiatives for renewed dialogue move in the right direction, but conferences cannot provide answers; they are good primarily for formulating questions. Perhaps even more vital is making such a platform sustainable. That will require creating a series of back-channel discussions, often called Track 1.5 and Track 2 meetings, to enable nongovernmental experts as well as national officials in unofficial capacities to begin to formulate solutions to technical, political, and legal issues on a broad variety of outstanding issues. Options for regulating weapons with nuclear and conventional capability. NATO in the 1960s and 1970s and Russia from 2000 to 2014 relied on nuclear weapons to balance their adversaries’ conventional advantage. It seems increasingly likely that the United States and NATO could respond in a similar way to the acquisition and deployment of more conventionally armed weapons by Russia. Consequently, arms control no longer can be limited to nuclear weapons. Sea- and air-launched intermediate-range weapons in and around Europe. 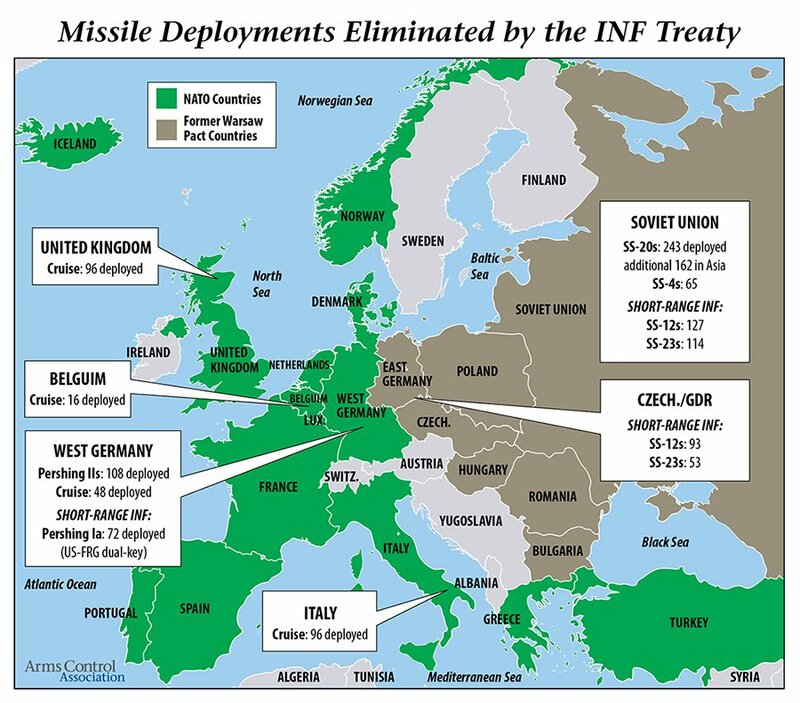 None of these weapons were limited by the INF Treaty, an omission that was a major Soviet concession during the treaty’s negotiation and will not be repeated. Today, Russia has similar weapons of its own, and their number is rapidly growing along with their capabilities, especially with the planned introduction of hypersonic weapons. The role of missile defense in European security and options for regulating it. Missile defense remains an untouchable topic for the West, but that situation is not sustainable. Russia will refuse to conclude new arms control agreements that exclude missile defense, and its own defense capability is growing. U.S. and NATO concerns about Russian defensive weapons deployments in Kaliningrad is an indicator of a much larger problem that cannot be addressed without putting Western defense assets on the table. Confidence-building and transparency measures between military forces deployed on land, sea, and air in Europe. Although not directly weapons related, this issue is timely, given the deterioration of the security environment and the growing likelihood of unintended confrontations with escalation potential. The need to address these risks in new regimes is acute. Luckily because they are easier to achieve, they should be made an independent avenue for early action. In addition to these discussions, an independent role of European countries could emphasize technical issues, especially accounting and verification. Nongovernmental and international organizations have done much forward-looking work in that area—the UN Institute for Disarmament Research has been particularly productive—but that work needs to be transferred to at least a semiofficial dialogue. Arms control negotiations have shown that these issues are particularly challenging and may take a very long time. It would help if at least some relevant work is done outside formal negotiations. There is even a vehicle that could be used for focused work in that area: the European Nonproliferation and Disarmament Consortium, which consists of a network of European think tanks and research centers. Nongovernmental work can be complemented by groups of technical experts, which are a time-honored, efficient tool for this kind of work beginning with the development in the 1950s of measures to verify limits or a ban on nuclear testing. Such groups could be initiated and sponsored by European countries, and they could pave the way for diplomats and politicians. Another role for European nations could involve developing European positions or drafts of future arms control agreements. Although there was a long-term decline in arms control expertise after the end of the Cold War, interest in these issues has surged in recent years, and there is a new generation of arms control experts. In fact, a close look suggests that the arms control community in Europe is growing as fast or faster than in the United States. European countries might produce a well-developed foundation for future agreements, including possible treaty language, and negotiate them separately with the United States and Russia so that the two Cold War superpowers would come to the negotiating table with ready text proposals. Such an endeavor would be a long shot—Europe is simply not accustomed to that role—but it is not unthinkable. The young generation of arms controllers in Europe seems to be professionally and psychologically ready to cross the traditional boundaries that Europe has set for itself and take a more proactive and central role in arms control. The second major question then is with whom Russia may be prepared to seriously engage. It is not enough for Europe to assume a leading role for interacting with Russia; it is also necessary for Russia to agree to talk with Europe in a serious, professional way without trying to utilize them for other purposes. Attempts to split NATO are, in the end, one possible goal for such interaction, and it will be vital to make such interaction focused on arms control rather than on unrelated policies. There is little reason to believe that Russia will want to engage in an arms control dialogue with the United States, although it will declare its readiness to do so. The likelihood of such dialogue was further reduced by Putin’s announcement that Moscow will no longer take a proactive approach, although all its earlier initiatives will remain on the table.4 Effectively, he has said that Russia will sit patiently and wait for others to come to it to ask, even beg, for arms control. The delay in arms control interaction will be driven not just by Washington, but equally by Moscow. Whether Russia may be interested in a meaningful dialogue with Europe will be largely determined by Europe’s behavior during the remaining months of the INF Treaty and New START. Russia offered a positive response to German initiatives when Russian Foreign Minister Sergey Lavrov met his German counterpart, Maas, on January 18 in Moscow expressing readiness to “jointly consider” development of new norms on nuclear weapons and, more broadly, strategic stability.5 A closer look, however, suggests that Russian post-INF Treaty interaction with Europe is far from assured. Europe has become a meaningful player in the INF Treaty conflict rather recently, after a briefing conducted last fall by the United States for its NATO allies to explain the U.S. position. Obviously, NATO supported this position and has tried to pressure Moscow to accept everything the United States wants. Germany has been particularly active in this regard; Maas has been making relevant statements on an almost weekly basis. A series of events launched after the failed U.S.-Russian consultations on January 15 in Geneva apparently were intended primarily for European consumption. Russia held two such events: a briefing for diplomats stationed in Moscow on January 18, which was held by the Foreign Ministry, and the display of the controversial 9M729 cruise missile—rather the purported missile in its canister and its associated launcher—by the Defense Ministry on January 22. The former was confidential, the latter was public, and significantly, Moscow disclosed new details about that missile system, which never been seen in the public domain. On January 25, Russia presented its perspective at the NATO-Russia Council, this time again behind closed doors. This activism can be interpreted in different ways. Some see it as evidence that “pressure is working” and that the INF Treaty could be saved with more pressure by the unified West to eventually force Moscow to accept U.S. demands before the treaty’s six-month withdrawal period. Such a development, which is not impossible but highly unlikely, would require a major Russian retreat and effectively return its policy to Soviet President Mikhail Gorbachev’s era, which is perceived today in Russia as bordering on high treason. More likely, Moscow will declare, “Well, we tried,” and happily allow the INF Treaty to end. Another explanation for Russia’s recent outreach entails a two-fold goal. The first is to demonstrate that Moscow had “gone the extra foot”—it would be too much to say “extra mile”—so that the collapse of an important arms control treaty could be blamed on Washington. This will hardly succeed. Alternatively, Russia’s recent engagements could be an attempt to find a better interlocutor in the West, one capable of listening to Russia. It is difficult to say whether Moscow truly hopes to split the West—such an endeavor is doomed to failure—but an attempt to open a new channel for dialogue on arms control cannot be ruled out. At the very least, Europe could transfer Moscow’s messages to Washington even if it refuses to develop its own, independent approach. In other words, the recent steps might indicate that Russia is already looking beyond the INF Treaty. Moving forward, Europe will need to fashion its statements and actions in such a way that they signal Atlantic solidarity and open-mindedness about future arms control regimes. As long as the latter is present, the former will hardly be seen in Moscow as discouraging. To achieve a proper balance between the two goals, Europe must demonstrate its ability and willingness to listen. Therefore, the decision by the majority of NATO members, including Germany, to decline the invitation to Russia’s January 22 missile demonstration was a mistake. It would have been better to attend and then criticize the insufficient transparency. After all, diplomacy is not about acceptance but about engagement. Refusal to talk does not improve prospects of an agreement; it makes agreement less likely. With today’s U.S.-Russian animosity, illustrated by the almost-dead INF Treaty and the similarly fated New START, the only actor who can successfully talk to Russia and with whom Russia may talk is Europe or, more precisely, certain individual European countries. They have the capacity to play that role. They can translate capacity into real action on two conditions. First, they need the political will to emerge from their traditional place on the margins to a more proactive role. Second, they need to start sending the correct signals now, without waiting for the end of the INF Treaty. The manner in which the treaty ends will determine how long the world must wait for renewed arms control. The longer the security environment is unregulated, the lower the chances for survival. During the Cold War, arms control efforts resulted from the Cuban missile crisis. Waiting for a similar stimulus is not the wisest course of action, as the world might not survive this time. 1. Frank-Walter Steinmeier, “More Security for Everyone in Europe: A Call for a Re-launch of Arms Control,” Organization for Security and Co-operation in Europe, n.d., https://www.osce.org/cio/261146?download=true (article originally published in Frankfurter Allgemeine Zeitung on August 26, 2016). 2. “National Statement by Heiko Maas, Member of the German Bundestag, Federal Minister for Foreign Affairs, at the OSCE Ministerial Council,” MC.DEL/25/18, December 7, 2018, https://www.osce.org/chairmanship/405665?download=true. 3. U.S. Department of Defense, “Nuclear Posture Review Report,” April 2010, p. 47, https://dod.defense.gov/Portals/1/features/defenseReviews/NPR/2010_Nuclear_Posture_Review_Report.pdf. 4. “Meeting With Sergey Lavrov and Sergey Shoigu,” February 2, 2019, http://kremlin.ru/events/president/news/59763 (in Russian). 5. Russian Ministry of Foreign Affairs, “Foreign Minister Sergey Lavrov’s Statement and Answers to Media Questions During a Joint News Conference Following Talks With Foreign Minister of Germany Heiko Maas,” January 18, 2019, http://www.mid.ru/ru/vizity-ministra/-/asset_publisher/ICoYBGcCUgTR/content/id/3478159?p_p_id=101_INSTANCE_ICoYBGcCUgTR&_101_INSTANCE_ICoYBGcCUgTR_languageId=en_GB. Nikolai Sokov is a senior fellow at the James Martin Center for Nonproliferation Studies, a program of the Middlebury Institute of International Studies at Monterey. A former official in the Soviet Ministry of Foreign Affairs, he participated in negotiations for the first and second strategic arms reduction treaties. “It gives reason to suspect our American counterparts of setting ground to…just let the treaty quietly expire,” Ryabkov said.